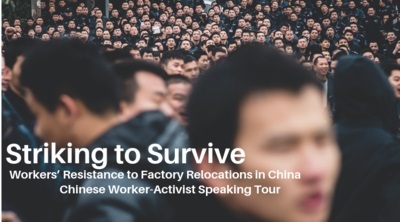 The struggles of these workers in China’s industrial centers are shaping the future of labor and workers' power not only in China but throughout the world. These vivid stories of workers at factories that supply multinational corporations Walmart and Uniqlo, compiled by worker-activists and circulated underground, provide a unique, on-the-ground perspective on the most recent wave of militancy among China’s enormous working class. "In China, A Surge in Strikes"
Labor Notes: "Chinese Workers Strike against Runaway Factories"
Li Wen has worked in electronics and jewelry factories in southern China. She interviews and documents the experience of factory workers who've joined collective struggles, and pays particular attention to issues of occupational injury and disease. Cornell University ILR, Ives Hall Faculty Wing, #281 Doherty Loungue, Ithaca NY, 21 September, 4:30 p.m.
Pennsylvania State University, Keller Building Room 502, 304 Fischer Rd., State College PA, 24 September, 11:30 a.m. The People's Forum, 320 West 37th Street, New York NY, 24 September, 6:00 p.m.
CUNY, 25 West 43rd Street, 18th Floor -- Room 18A, NewYork NY, 25 September, 12:00 p.m.
Temple University, 821 Anderson Hall Women's Studies Lounge, 1835 N. 12th Street, Philadelphia, PA, 26 September, 2:00 p.m.
Johns Hopkins University, Mergenthaler Hall Room 526, Baltimore MD, 27 September, 1:30 p.m.
Columbia College, Hokin Hall Room 109, 623 S. Wabash, Chicago IL, 29 September, 4:00 p.m.
Countering the popular myth that Chinese workers are “stealing American jobs,” Striking to Survive documents deindustrialization in China’s Pearl River Delta and struggles by workers there to hold on to their livelihoods and their pensions." So lame, Ithaca is only a 2 hour drive for me and I would have dipped out of work for this if I hadn't just seen this a day to late. Any chance of one of these talks being recorded? Sorry you couldn't make it. Unfortunately, due to safety concerns, none of the events will be recorded. But we would suggest that you acquire the book, read it over the next 2 weeks, and post questions right here as the authors will be staying with some of us out west next month and we could pose the questions to them personally and post their replies here on this thread. But we would suggest that you acquire the book . . .
That books looks really interesting; ordered my copy in dead-tree format just now. I wish I could make one of the talk, but alas they're all too far away for me.